Economist critiques of FOMC (Federal Open Market Committee) policy choices typically treat the Federal Reserve System as a sovereign decision-maker, whose managers seek singlemindedly to promote the public interest at every turn. 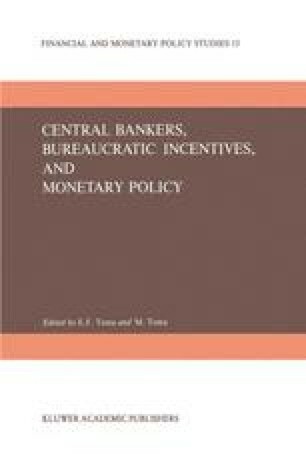 From this perspective, choosing strategy and tactics for monetary control becomes a straightforward exercise in applied welfare economics, albeit one with difficult stochastic complications (Wood, 1967; Poole, 1970; Waud, 1975; Andersen and Karnosky, 1977; Higgins, 1978; Lombra and Struble, 1978). With Fed bureaucracy and bureaucrats having no contending interests of their own, the central bank’s policy task becomes merely to maximize the expected value of a constrained social welfare function. This ‘utopian’ objective function is defined over a set of policy goals (ideal values for specific dimensions of national economic performance) and is represented as a decreasing function of squared (or absolute) deviations from these goals. Operative constraints consist of information describing both the developing state of the aggregate economy and the ways in which variables directly under the Fed’s control (policy instruments) link up with the goal variables (Wood, 1967; Friedlaender, 1973; Potts and Luckett, 1978). In this view, the Fed’s principal problems are informational: how to quantify its goals and restraints. Everett D. Reese Professor of Banking and Monetary Economics. The author is indebted to Richard C. Aspinwall, Raymond Lombra and Will Mason for comments on earlier treatments of this material. The paper was presented at the November 1978 meetings of The Southern Economic Association.